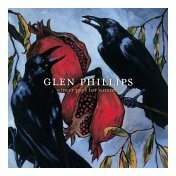 Like many artistically-inclined songwriters, Glen Phillips suffers from a lack of confidence in his abilities, and for him, this tends to manifest itself in a cyclical pattern of self-fulfillment and self-destruction. In other words, his finest achievements have come when expectations were low, and he typically has followed his successes with outings that not only felt safe, but also were utterly generic in tone. After guiding Toad the Wet Sprocket in the creation of its pop gem Dulcinea, for example, Phillips’ former band issued the bland Coil, and although the decline in quality could have been explained by the subsequent announcement of his ensemble’s disbandment, he now appears to be falling into a similar pattern with his solo career. Indeed, coming in the wake of the understated gracefulness of Abulum — an outing that no one really expected to be quite as good as it was — Phillips’ sophomore effort Winter Pays for Summer is merely an indistinct affair on which he tries too hard to chase the marketplace’s current infatuation with the sounds of the ’70s and ’80s. Consequently, the gambit fails because he can’t seem to determine into which niche he should position himself. Part of the problem, undoubtedly, is the employment of producer John Fields (Switchfoot, Andrew W.K. ), who slathers the collection with the sort of crisp, run-of-the-mill, tricks of the trade that dilute Phillips’ songs and make them sound more manufactured than organic. In fact, half of the album’s tracks — such as Falling, Finally Fading, Gather, and most egregiously, the first single Thankful — seem geared towards placement on a teen television show or, worse, they seem designed to fit within the disposable confines of a music downloading service.